Available in 20 different colours and designs. The VELUX pleated blind will soften the light entering the room to different degrees depending on the colour of the blind. 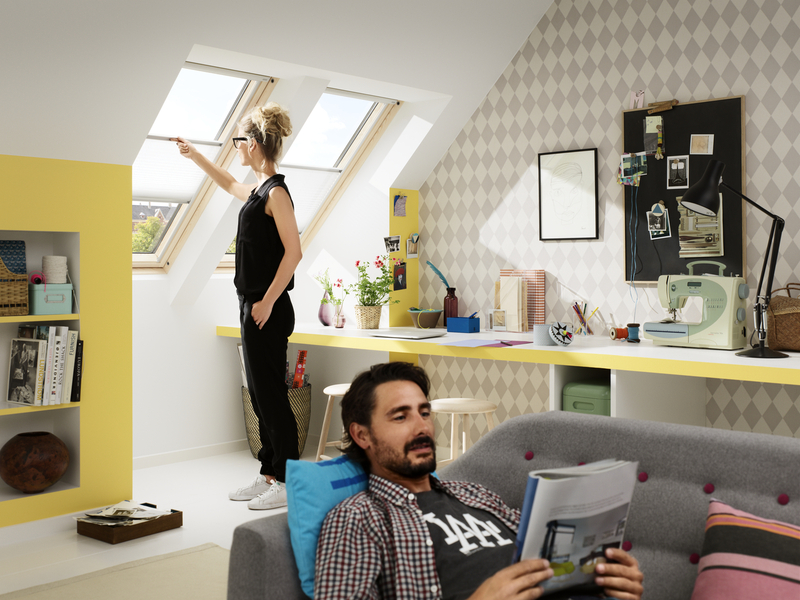 To choose the right operation of your VELUX blind, you should consider where your roof windows is placed and how often you expect to adjust the position of the blind. Electrically powered pleated blinds are remote controlled and are the ideal choice for those with out-of-reach VELUX roof windows, or those who wish to add that added touch of innovative luxury to their loft room. "Flying" manually operated pleated blinds are very easy to use. The blind runs in side rails that ensure a smooth operation and stepless positioning. It is neither attached to the bottom nor top of the window allowing you to adjust the blind from the top down as well as from the bottom up. Simply use the control bar at the bottom or top of the blind and raise or lower as you please. To ease the operation of a manually operated blind with control bar, you can also purchase rod controls, rod extension pieces and rod adaptors. Remote controlled and electrically powered pleated blinds are operated with the intelligent touch-screen VELUX INTEGRA® control pad originally supplied with your VELUX INTEGRA® roof window. An intuitive solution that lets you easily control your blinds remotely. 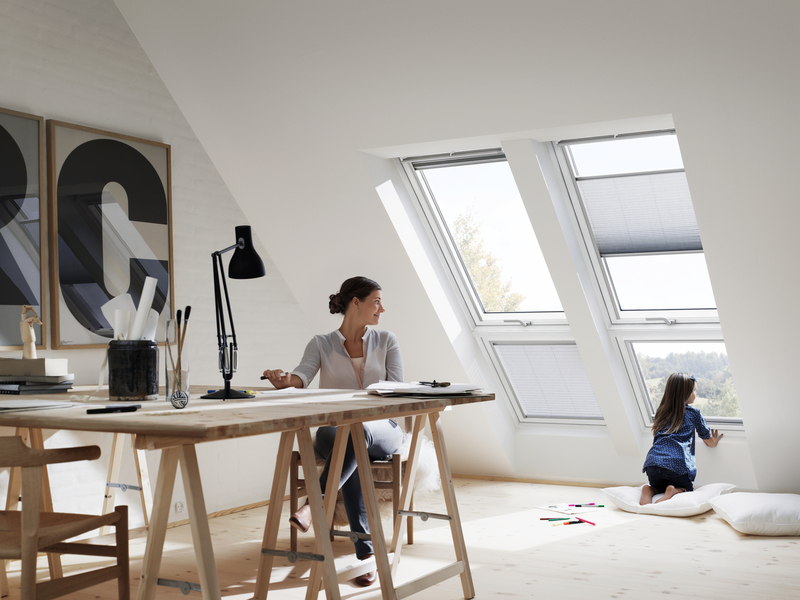 The VELUX INTEGRA® control pad offers an array of pre-set programs for everyday comfort and an improved indoor climate. You can control the blind from anywhere in your room and enjoy all the features of the pre-set programs such as the possibility to program the blinds to raise and lower at specific hours. If necessary, the blind can also be raised and lowered manually with the control bar at the bottom of the blind. What if I don't have an electrically powered VELUX INTEGRA® roof window? If you don't have an electrically powered VELUX INTEGRA® roof window, but would like an electric powered blind, try the control system KUX 100. This will allow you to use the electrically powered VELUX blinds or shutters in manually operated roof windows. Or try the control system KMX 100 and turn your entire manually operated roof window into an automated one. The control system KMX 100 will allow you to operate multiple electrical products. Both control systems include a VELUX remote control that will make the blind or shutter io-homecontrol® compatible. The control system KMX 100 also includes a rain sensor. VELUX pleated blinds are made of a translucent polyester cloth. The concealed cords are made of wear-resistant polyester. The blinds run in slim, elegant side channels made of anodised aluminium that prevent light leakage. 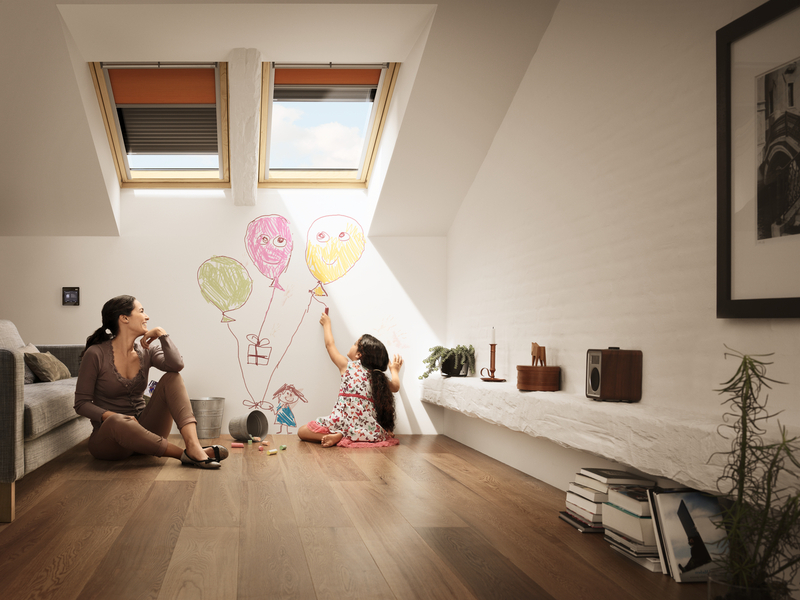 All VELUX products are made to exacting standards from the highest quality materials and have been designed for many years of trouble-free use. All VELUX blinds and shutters are backed by a 3-year guarantee. The VELUX guarantee does not in any way affect your statutory rights. If you find it difficult to make up your mind, we also offer cloth samples for all blinds and colours offered in our e-shop. Please note that the cloth samples are intended as a colour and texture sample only and may not show the full design. Every effort is made to ensure that the samples supplied correspond as closely as possible to the colours of our products. Our pre-installed patented mounting brackets come as standard on every VELUX roof window – and they fit any of our VELUX blinds making installation hassle-free. Installation instructions will be included when you purchase a blind. The PDFs are detailed, illustrative instructions that carefully takes you trough every single step in the installation process. To be able to read a PDF file you need to have Acrobat Reader on your computer. The tool is free and can be downloaded from Adobe for free. The pleated blind can also be combined with VELUX awning blinds and roller shutters for additional heat protection and VELUX insect screens for an insect-free environment – even when your window is open. Ready for the smart home future? VELUX ACTIVE with NETATMO makes it easy to operate your VELUX INTEGRA® blinds with your smart phone or using voice control. The VELUX duo blackout blind is a blackout blind and a pleated blind in one. It offers the best of both worlds: Blackout at anytime and softly diffused natural light all day. It is available in all blackout blind colours in combination with a white, pleated blind. 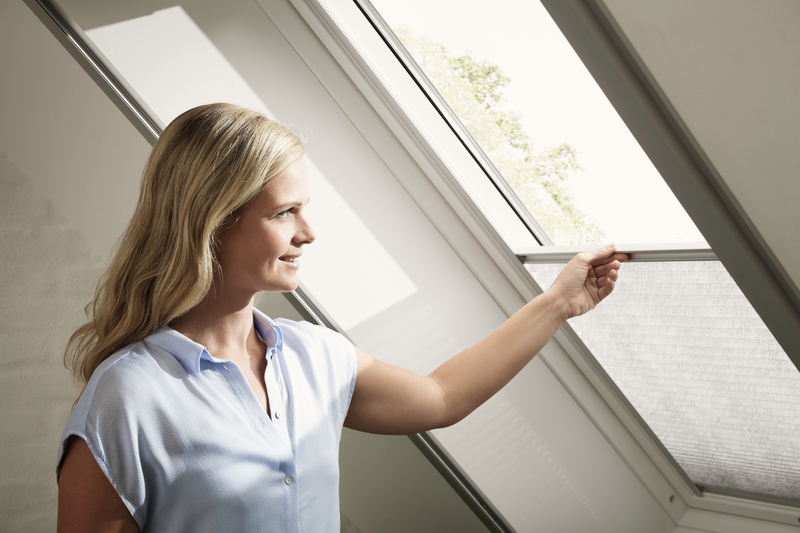 VELUX energy blinds feature a double-pleated blackout cloth with an aluminium honeycomb structure inside that improves insulation by up to 34%. And because they are not fixed at the top or bottom, they can be positioned anywhere in the window to provide variable blackout, light control and privacy.